At 458 West bed and breakfast, we celebrate hospitality by providing our guests with peaceful and welcoming room accommodations, and hearty southern breakfasts. Recently renovated, we combined the original architectural style of the house with the comforts of the 21st century, creating a warm, comfortable bed and breakfast. Our inn has been featured in "25 Perfect Romantic Summer Getaways in North Carolina" by VacationIdea - Dream Vacation Magazine. Check out the following link: http://vacationidea.com/nc/north-carolina-getaways.html. 458 West bed & breakfast is located a half mile from the 'circle' in downtown Pittsboro, and within minutes of Chapel Hill, Raleigh, Cary, Durham, and Sanford. We are within easy walking distance of Roy Underhill's Woodwright's School and the Pittsboro downtown district. 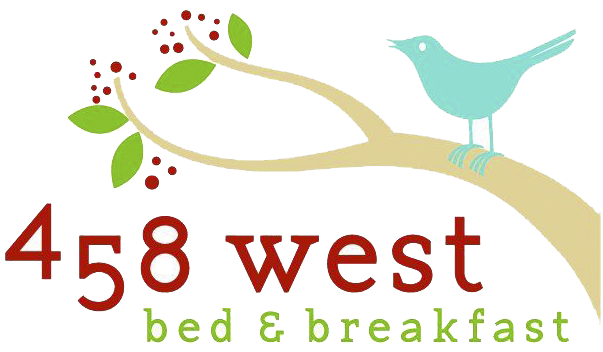 The next time you have lodging needs in the area; we hope to see you at 458 West B&B. Renovating 458 West bed and breakfast was a labor of love, a 3 1/2 year project. We combined the old with the new to create a warm, comfortable inn. We kept the original architectural style inside and out, yet we added the comforts of the 21st century. One of our favorite features of the house is the 10-foot wide wrap-around porch that takes you back in time to a more relaxed and slower-paced life style. The porch overlooks the original, majestic pecan trees that shelter the house from the heat of summer and cool of winter. We invite you to come stay with us, rock awhile, and enjoy the beautiful gardens we are adding to the grounds. Reclaimed, repurposed, recycled, however you re-name it, preserving the historic integrity of our bed and breakfast was fore first in our minds when we began planning 458 West. Before we wielded the first hammer, we were on a mission to restore our house to its former glory. One of the first things we did was salvage the many pecan trees that grace the front yard of 458 West. Whether you like roasted pecans, pecan waffles, pralines or simply trees, you’ll be glad we did.